Venice is half about eating and drinking, but it’s wise to head to where the locals go. That way you can have the best meals at reasonable prices in an atmospheric setting filled with Italians relaxing after a hard day at work. Night falls quite late in Italy – it was still light around 9pm, which is when most places start shutting down, including restaurants. The sky had turned black however, flashing with streaks of lightening, and I stopped at a local bar for limoncello, a traditional lemon liqueur that acts as a digestif. I sat outside, taking in the breeze, the chatter of locals walking home, the sound of shutters rolling down. It was the most relaxed I had been in a long time. After a good night’s sleep, I was up early, awoken by the deep gong of church bells wafting from across the canal. It was a wonderfully pleasant morning and Venice was just waking from its slumber. Bristling to start the day, I quickly downed a shot of traditional espresso, and off we went for sightseeing. Piazza San Marco, St Mark’s Basilica and Palazzo Ducale were on my shortlist. I headed off on the water bus to San Marco or St Mark’s Square, arguably the place to go to in Venice. It was a long and leisurely trip on the water, and we passed beautiful houses, quaint restaurants on the Grand Canal and the Peggy Guggenheim Collection — a grand museum of modern art. Baroque churches and scores of cafes lined the canal. Piazza San Marco seems to be the place the entire city is concentrated. It is choc-a-bloc with open air restaurants, where you’ll find tango orchestras playing for customers during lunch, and boutiques. People sit around the piazza, like we would sit in coffee shops in Kolkata. They feed the hundreds of pigeons whose home the square is, and perhaps take photographs, eat gelatos or have an afternoon drink. After visiting St Mark’s Basilica and Doge’s Palace, which overlooks the sea, I bought a delicious nutty gelato and sat by the sea, watching countless gondolas and water taxis ferrying passengers. It was people watching at its best, and while the hot sun did me no favors, I enjoyed myself thoroughly. It was my final night in Venice, so late evening I went out for a long walk before sitting down to dinner in one of the countless restaurants that line the Grand Canal. The owner was a sprightly gentleman in his 70s, utterly charming and a delight to have around. Italy is full of Bangladeshi immigrants, so it wasn’t surprising that a Bengali waiter waited on us. I chose a massive cream dory from the fresh fish stand, and off he went, grilling it whole before bringing it to the table. Here he removed the head and bones, squeezed some lemon juice on top, and served it with fresh greens. The meal was made even more memorable when the elderly gentleman brought me a butterscotch dessert on the house. It was sheer bliss, and I decided that even though Venice is a cliché, it’s where my heart will always be. 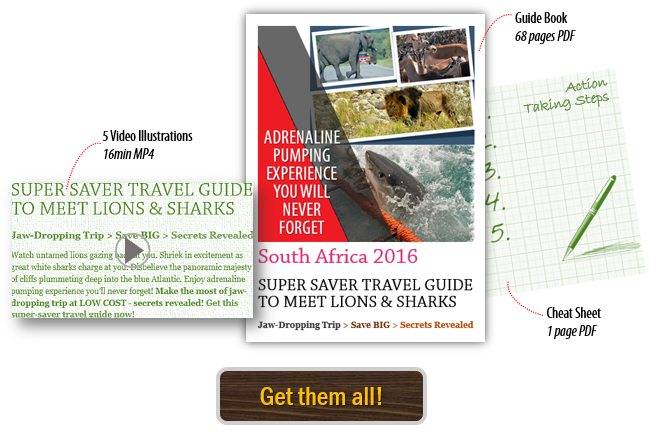 Get my super-saver travel guide package below for a jaw-dropping trip to the wild worlds of South Africa! !